Meet an original way of catalog browsing! Such bonuses as easy shopping process, improved usability and customer loyalty as a result are attached! Imagine a situation when you go to the supermarket and in order to move through the departments you have to open a door each time. It sounds ridiculous, doesn't it? Your online store is the same, when customers have to click all the time. Customers should pay attention to products, not to the interface. Making a purchase for them has to be as easy as breathing. Magento 1 AJAX Scroll module is one of the tools which can do this. Possibility to give links to any place of the page. For instance, you've scrolled down to the 6-th page. Give a direct link to your friend to start browsing right from this position. The client is able to see more goods in less time without the need of searching for the 'next page' link and looking around the page. As you know, user's attention decreases after clicking 2-3 pages. If the client doesn't find what he needs and escapes from your web site it is bad for SEO. Magento 1 infinite scroll is a great way to reduce the bounce rate by displaying all the goods at 1 page. The customers will be a lot more likely to find the desired products at your store and place orders. Imagine that now you have a possibility to draw the attention of your potential clients to all the goods you offer. Chances are high that the client will be absorbed with shopping, eventually will find the right product and buy it. You don't have to worry whether the customer will see the items on the last page, now it is the job of AJAX Scroll. An extremely convenient way for customers to get straight back to the top of the product list. Let customers share and bookmark links to certain positions in the product list. For example a customer finds some interesting products at page 7, to which he would like to return later. So he can bookmark it and even share it with friends. There is no need to scroll the products again. No need to seek the 'next page' button, scroll down the mouse wheel and the next page will appear. It is very convenient to return to previous pages - just scroll up without clicking the 'previous page' button. Want to check product details? Feel free to do so: Ajax Scroll will remember your position and bring you back directly to the same place in the catalog. Full support of browser 'back' button. This helps to ensure seamless user-experience. 2 Magento AJAX Scroll modes are available: automatic and by request. Choose which one you like! Forget about pagination: with Magento AJAX catalog customers can easily scroll between pages, up and down. They can also see what page of the catalog they're on, total amount of pages scrolled. This helps to increase time on page and the number of products views. This Magento AJAX catalog module greatly complements Improved Layered Navigation extension. Your clients are lost in the abundance of goods? Help them to find the way! Improved Layered Navigation extension guides the clients to the products they need. Now the customers can have enormous fun by conveniently viewing the products they want to buy. AJAX Image Uploader enables you upload multiple images fast and easy with drag-and-drop functionality. There's a lot of boring work in Magento, make that one enjoyable. The code is well written and Amasty are very helpful in adressing any issues. I would thoroughly recommend this extension. Great product. they fixed the bugs related to my custom theme with kindness and promptness. we did a back and forth about 4-5 times. normally other companies just stop answering from my experience leaving you dead in the water but not amasty! till date, best support ever I have interact with any team, any developer for any cause. Now I am a permanent customer of yours. The support team has solved a bug in a different extension which was conflicting with Ajax scroll. We were very satisfied. The extension worked fine right out of the box. According to some articles I read ajax catalog ensures that customers will look through more pages as opposed to standard pagination. I haven’t checked t his yet but this seems logical. 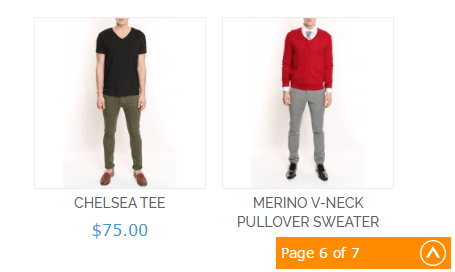 Ajax scroll is great for my store as I have about 5-10 pages in each category (I sell exclusive products). I think having 100+ pages with ajax scroll would be problematic. There’s also one suggestion on the extension functionality: it’s great to have a “Back to Top” button but it would also be useful to have a kind of “Back to Page” link which will let a customer get back to the page he was looking at before going to the top. I bought this extension to use on a Magneto 1.9 site and it's great. Amasty helped me out when it there was a compatibility issue with the theme I was using. Great company, I definitely recommend using Amasty's extensions. Great feature for our webshop! The support is outstanding. Thanks Amasty! Everything simple is genius. It's also about the ajax scroll. The extension works like a well oiled machine. I hope other Amasty mods work like this one. Must have for those who wants to improve their store usability. The scroll feature works pretty well. I've just launched my e-shop and decided to load it with some user-friendly stuff. This extension is one of the modules I've purchased from different companies. And you know - this is the only place where support helped me withing an hour since my ticket was sent. Thanks, Amasty! I'll definitely come back for more extensions. Scroll it up and down - no more flipping through pages - that's great! 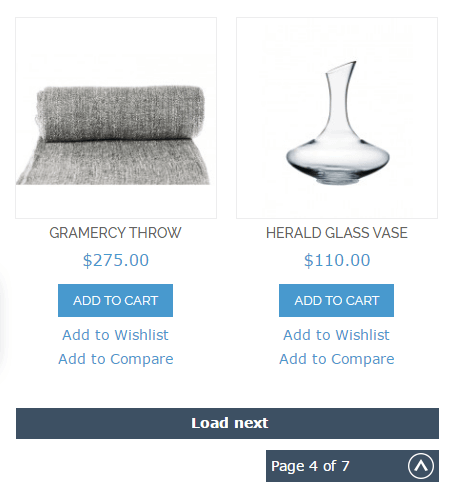 AJAX search works perfectly, it enhances store usability and helps customers find products faster. Product search is better in its niche. And I do like its customization possibilities that help to to make my site fast and attractive. I've really appreciated new features you've recently added. Scrolling down the page is much better than flipping through pages, and the customozable tab that shows pages numbers is great! Installed this extension very quickly. Everything is clear and all the features work the way they should. Well done! It has very good feature of Product Search by Ajax. I really like this extension. – Performance optimization: load our block and scripts only on pages with products.